At most baby showers the guest of honored will be "showered" with tons of cute baby clothes and goodies. Not often are gifts given for the mom only. After I had my baby shower when I was pregnant with my son, I sat in what would be his room, surrounded by a ton of baby shower gift bags. I had lots of clothes, diapers and wipes. I was very blessed. What I did not have, and didn't know at the time exactly what I would really need, was my hospital bag for when I went into labor! 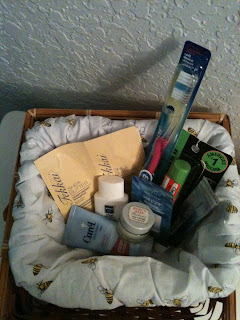 After the birth of my son, I realized that one gift that would really help a mommy-to-be is a hospital bag! Or at least some items that should go into a hospital overnight bag. A few magazines. After the baby is born, there will be some down time, and the mom might get bored. I did! Crystal light packets to add to bottled or hospital water. Starbucks VIA packets...for the Dad! Printable coloring pages and a few crayons if mom-to-be will have kids waiting in the waiting room for her. If you would feel awkward giving this type of gift, just know, the mom will appreciate it. Especially first time moms who may be planning to pack a huge diaper bag full of baby goodies, and skimp on momma items. You can always use this gift idea to supplement a gift for the baby. What is your favorite gift to give or receive for baby showers? How do you feel about giving/receiving "frugal" gifts? I love this idea! I just had my first baby and had no clue what to pack for myself other than my toothbrush! I ended up having to stay in the hospital for a week and had to have my sister in law grab stuff from my house... If I had gotten a gift like the one you mentioned I would have been totally prepared and probably a bit happier as well! As far as how I feel about giving/receiving frugal gifts, I think they're great! It's not awkward to me at all. Sometimes they are even the BEST gifts because they are sometimes hand made which makes them even more special. Thanks for sharing! My favorite gift-my friend stopping by to admire my sweet, incredible little boy. Telling me how cute he was-that like was like an instant "momma drug". I thought he was cute too! I felt weird telling other people how crazy I was about him and she instantly understood and joined me in my excitement. Don't underestimate the power of time and emotional support. I'll never forget it Susie! What a great idea! One of the most thoughtful gifts I received came from a sweet lady from church who visited the week after we came home from the hospital--she brought a baby gift, plus a goodie bag full of girlie magazines, chocolate and really good decaf coffee. It was so sweet and thoughtful. @Terry Danielle Terry, thanks for sharing! I can't imagine being in the hospital for a week, un-prepared! I was in for 3 days with my son after I had him, and 45 minutes from home. I was somewhat prepared, but there are just some things I had wished someone would have told me might be needed! @Erica That is so true! I absolutely loved when my best friend came to the hospital and squealed and cooed over my son! She was just as excited as my husband and I! @tmp718 You're welcome :0) and great! I'm sure they will love this idea as well! @MargaretB That sounds like a great idea too! I love the decaf coffee idea especially. It is such a thoughtful gift, along with the magazines. Homemade Facial Cleanser, cheap and easy! This week's menu plan, and my impromptu eat from the pantry challenge!